Ethylene, C2H4, is a highly flammable, colorless and noncorrosive gas with a sweet odor. It is easily ignited and a flame can easily flash back to the source of the leak. Under prolonged exposure to fire or heat the containers may rupture violently and rocket. Can cause explosion. Vapors arising from the boiling liquid are lighter than air. Ethylene is not toxic, but is a simple asphyxiant. Ethylene is used as an anesthetic, a refrigerant, and to make other chemicals as polymers and plastics. Ethylene is produced in petrochemical processes, as steam cracking where hydrocarbons and steam are heated to 750–950 °C. This process converts large hydrocarbons into smaller ones and introduces unsaturated products. The phase diagram of ethylene is shown below the table. Values are given for gas phase at 25oC /77oF / 298 K and 1 bara, if not other phase, temperature or pressure given. as well as Thermophysical properties of: Acetone, Acetylene, Air, Ammonia, Argon, Benzene, Butane, Carbon dioxide, Carbon monoxide, Ethane, Ethanol, Helium, Hydrogen, Hydrogen sulfide, Methane, Methanol, Nitrogen, Oxygen, Pentane, Propane, Toluene, Water and Heavy water, D2O. Ethylene is a gas at standard conditions. However, at low temperature and/or high pressures the gas becomes a liquid or a solid. 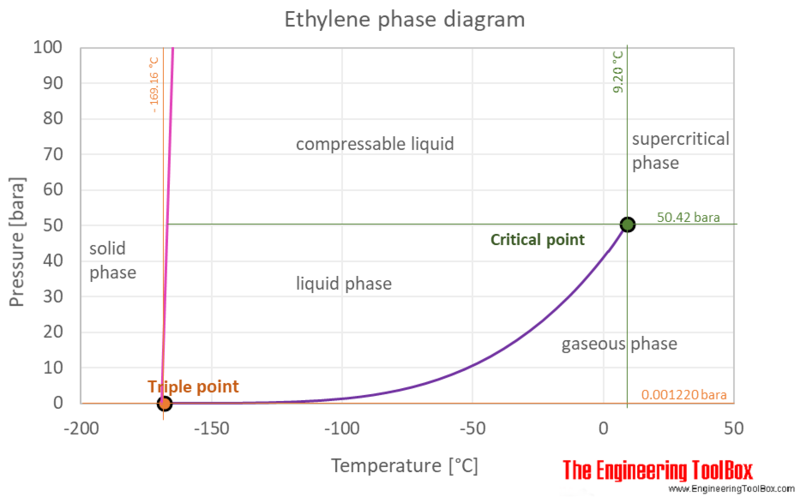 The ethylene phase diagram shows the phase behavior with changes in temperature and pressure. The curve between the critical point and the triple point shows the ethylene boiling point with changes in pressure. It also shows the saturation pressure with changes in temperature. Engineering ToolBox, (2018). Ethylene - Thermophysical Properties. [online] Available at: https://www.engineeringtoolbox.com/ethylene-ethene-C2H4-properties-d_2104.html [Accessed Day Mo. Year].